February is prime time to start planning your summer swimming pool project. Now is the time to contact your local Houston pool builder to get added to their construction schedule. Choosing your pool design can be an overwhelming tasks for some of you, so we’re dedicating the next few weeks of our blog to Houston pool design trends to give you an education on the latest pool design style! What kind of pool is right for you? Gone are the days of classic kidney-shaped pools. Houston homeowners have stepped it up in terms of custom pool design and style. Nowadays pools can be any shape, size or color, and can even mimic walking out into the ocean. To determine what works best for you, consider the options. 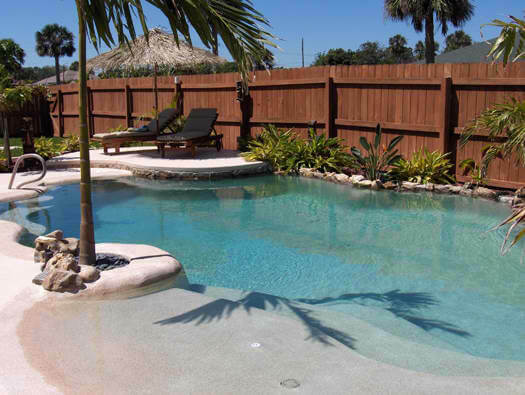 Each type of pool varies in price point, but can look beautiful nonetheless. Fiberglass: prefabricated pool manufactured in a factory and placed into already excavated site. A variety of shapes and sizes are available but limited. Vinyl-Liner: a kit pool that is constructed on-site. Once the structure is put together, a custom fit vinyl liner is placed around the deck and then filled with water. Beach-Entry: aka zero-entry pool; designed with an entry that gradually slopes from the deck into the water, like a natural beach. No stairs or ladders necessary to get in. A popular Houston custom pool design trend is the pool and spa combo. These custom projects stand out for their elegance and beauty, and often times create a seamless transition from one body of water to the next. In order to achieve that seamless transition, the spa is designed to sit within the pool and has a perimeter overflow, creating the effect of the spa spilling into the pool at all 360 degrees. But don’t be fooled. Not all of these combos are circular. Many have a modern feel and feature square or rectangular spas. Not every combo can feature a perimeter overflow, though. Some pools and spas are separated by a wall adorned in glass tile, stone, travertine or slate. And while the combo concept isn’t new, the way in which designers create the overall look is. Gone are the days of a bland pool with a hot tub just a few steps away. Designers are using more dynamic materials to transition the two bodies of water and incorporating waterfalls and water features into the overall look to create a more original feel.